To tell a story one must normally know the ending. Truth, is in this case the ending is far from being written. After the atomic bomb attacks on Hiroshima and Nagasaki, many countries began investigating the possibility of the “bomb”. The Soviet regime, at the height of their political power was aware that they had a few year gap in developing their nuclear capacities. It was then that the order came to build a top secret plutonium enrichment facility and several reactors at a disclosed location. This location is Mayak, the birth place of the Soviet bomb. In the peaceful region of the South Urals, that had known little activities before, accept for Lavrenty Beria’s gulags of course. In a hurry, Stalin dispatched many of his top scientists to Mayak to build the site, among them, Soviet engineering and physicist Igor Kurchatov. Supervision of the project was in the hands of Stalin’s closest ally, and notorious secret-police chief Beria. In these pioneering days of nuclear exploitation, environmental standards where never a priority. The reactors and enrichment facility as well as the centrifuges were built at an enormous pace, leaving little time and place to look for a proper way to store low level and medium level radioactive waste (LLW, MLW). Most of the waste in the 1940s and up to 1952 was dumped into the nearby river and complex ecosystem of the “Techa” . It’s only a few years ago that “RosAtom”, the state owned exploitation conglomerate of nuclear energy in Russia acknowledged, that this way of disposing of radioactive waste, was a common practice up until 2005. The Federal Russian Prosecutor’s Office later found out, that in 2004 alone, 60’000m3 were released into the Techa river. By today, most of the Techa must be regarded as LLW to MLW, although the river is still the water reserve of many cities and villages in the Ural. The site of Mayak didn’t proof well for supplying cooling water. The river Techa was too shallow and the next big cooling lake Kyzyltash became rapidly so contaminated as it was an open(!) cooling system. The short term solution was to dig nuclear containment vessels into the ground. After numerous accidents, the most crucial one, happened on September 29 September 1957. An underground tank filled with medium to high level nuclear waste exploded. The explosion, visible for many kilometers left inhabitants scared. 23.000 square kilometers had been permanently contaminated. The fallout region is up to this date known as the “East Ural Radioactive trace”. As a consequence 34 villages and towns were evacuated, 20.000 people displaced and evacuated. The leftover radioactive waste from the accident (20 million cu) was dumped into Lake Karachay, up until today known as the most polluted place on the planet. The Lake was covered with concrete blocks to prevent sediment changes, as a huge dust storm left 400.000 people contaminated in 1967. With a concentration of 12-times the radioactive isotopes that were liberated in the Chernobyl accidents, a stay of 4-5 minutes would result in a deadly dose followed by acute radiation sickness and death by organ failure. The contaminated region around the southern Ural city of Chelyabinsk has a unique feature: Here some people suffer from the consequences of radiation in the 3rd generation. The workers that build the plant, liquidators from the 1957 and 1967 nuclear events, inhabitants of the south Ural. It goes that far that entire families have three generations of people dying of the consequences of the Mayak accidents. The errors and faulty plants existence and records were only published as a consequence of the Glasnost and Perestroika movements in the Soviet Union in 1990. Since it is hard to pinpoint the responsible of these acts, the victims are left alone and face difficult conditions such as poor access to public health care. Nadezhda Kutepova fights for the rights of these people. As a Russian human rights lawyer, she is representing her clients, victims from the contaminated region of the South Ural radioactive trace region in front of different courts in Russia and in front of the Human Rights court in Strasbourg. Nadezhda, who lost both her parents and grandmother to “Mayak”. Her grandmother was one of the nuclear engineers assisting Kurchatov in building the Soviet bomb, her father was a liquidator of 1957 and her mother a physician in the emergency services of the site. The cases that Nadezhda takes on, are eerie examples of how Nuclear energy and weapon production is a threat to human life. On one hand, she has cases of victims from the early years of exploitation of Mayak: liquidators from 1957, children and pregnant women that were forcefully enlisted to destroy crops and fields that were heavily contaminated, 2nd and 3rd generation victims that suffer from genetic diseases, leukemia, cancer or other radiation-related diseases. Many of these liquidators and clean up experts where detailed to Chernobyl in 1986 to help with the unprecedented clean up task and building of the sarcophagus. Still today, there are cases or birth defects where Nadezhda fights for justice, with many cases won in front of regional and the Human rights court in Strasbourg. Her work has earned her a Nuclear Free Future Award in the Category “Resistance”. 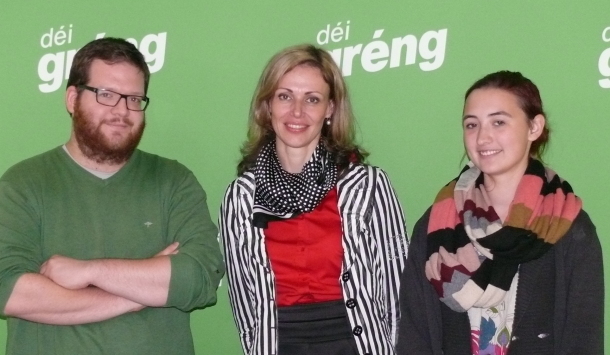 Picture Description: Philippe Schockweiler (FYEG) with Nadezhda Kutepova and Gina Arvai, co-Spokesperson of déi jonk gréng. Tagged Human rights, Mayak, Nadezhda Kutepova, nuclear, Philippe Schockweiler. Bookmark the permalink.